I have used Arduino with hobby servos often, but I was getting annoyed of the jitter of the standard servo-library. So I took my newly acquired Rigol DS2072 and tried to figure out what was causing the servos to rattle and jitter. then most of the jitter is gone. But I discovered that the 50 Hz PWM signal needed for the servo was generated in such a way that the 50 Hz frequency of was not stable. This can also cause jitter on all channels if only one servo is moving fast. I guess this will only affect some servos, since the pulse width is always correct. So I ended up writing all the servo PWM generating code from scratch. I used timer 2 for 50 Hz timing to get correct frequency for all servos all the time. I then used timer 1 for timing the pulse width. The original servo library uses prescaler 8 for timer 1. This will give a resolution of 1/2 us steps. I decided to go for prescaler 1. This will give a resolution of 1/16 us. A servo that accept a 500-2500 μs range, will get this in 32000 steps. Thus 15 bit resolution. This will not always be valid since there will still be some jittering. By jittering I mean that the pulse width is not stable. I got it Down to 200-400 ns. By using both compare A and B for timer 1, I was able to control 2*10 servos. Every servo is starting its pulse 2000 μs after the previous one. This means the pulse can extend into the next servo timing. To do this I used compare A and B for timer 2 as well. // UNO_20_Servos_Controller.ino - High definition (15 bit), low jitter, 20 servo software for Atmega328P and Arduino UNO. Version 1. // Jitter is typical 200-400 ns. 32000 steps resolution for 0-180 degrees. In 18 servos mode it can receive serial servo-move commands. // Copyright (c) 2013 Arvid Mortensen. All right reserved. // version 2.1 of the License, or (at your option) any later version. // Lesser General Public License for more details. // This software will only work with ATMEGA328P (Arduino UNO and compatible. Or that is what I have tested it with anyways.... !!!! // 18 or 20 pins are used for the servos. These pins are all pre configured. // ServoMove() function. The range of the ServoPW is 8320 to 39680. 8320=520us. 39680=2480us. // PO = Pulse offset in us. -2500 to 2500 in us. Used to trim servo position. // I = Invert servo movements. // N = Non-invert servo movements. // Q = Query movement. Return "." if no servo moves and "+" if there are any servos moving. // QP = Query servo pulse width. Return 20 bytes where each is from 50 to 250 in 10us resolution. //      So you need to multiply byte by 10 to get pulse width in us. First byte is servo 0 and last byte is servo 20. //  = Carrage return. ASCII value 13. Used to end command. // #0 P1500 T1000                        - Move Servo 0 to 1500us in 1 second. // #0 p24000 T1000                       - Move Servo 0 to 1500us in 1 second. // #0 P1000 #1 P2000 T2000               - Move Servo 0 and servo at the samt time from current pos to 1000us and 2000us in 2 second. // #0 P1000 #1 P1200 S500 #2 P1400 T1000 - Move servo 0, 1 and 2 at the same time, but the one that takes longes S500 or T1000 will be used. // #define HDServoMode 18           - This will set 18 channels mode so you can use serial in and out. Serial command interpreter is activated. // #define HDServoMode 20           - This will set 20 channels mode, and you can not use serial. //                                    A demo will run in the loop() routine . Serial command interpreter is not active. //                                    use ServoMove(int Channel, long PulseHD, long SpeedHD, long Time) to control servos. //                                    ServoPW array directly, but take care not to go under/over 8320/39680. // Use ServoMove(int Channel, long PulseHD, long SpeedHD, long Time) to control servos. ServoSetup();                       //Initiate timers and misc. TIMSK0 = 0;                       // Disable timer 0. This can reduse jitter some more. But it's used for delay() funtions. #endif                              // This will disable delay()! #if HDServoMode == 18               //Serial command interpreter is acive. 18-servos mode. #elif HDServoMode == 20             //Demo dance is active. 20-servos mode. for(i2 = 0; i2 < 5 ; i2++)           // All servos go to random position. Then go back to middle in same time. void RealTime50Hz() //Move servos every 20ms to the desired position. ISR(TIMER1_COMPA_vect) // Interrupt routine for timer 1 compare A. Used for timing each pulse width for the servo PWM. ISR(TIMER1_COMPB_vect) // Interrupt routine for timer 1 compare A. Used for timing each pulse width for the servo PWM. ISR(TIMER2_COMPA_vect) // Interrupt routine for timer 2 compare A. Used for timing 50Hz for each servo. ISR(TIMER2_COMPB_vect) // Interrupt routine for timer 2 compare A. Used for timing 50Hz for each servo. if(ServoInvert[Timer2Toggle]) OCR1A = 48000 - ServoPW[Timer2Toggle] - 7985;                // Set timer1 count for pulse width. if(ServoInvert[Timer2Toggle+10]) OCR1B = 48000 - ServoPW[Timer2Toggle+10]-7970;            // Set timer1 count for pulse width. Timer2Toggle++;                                    // Next servo in line. Timer2Toggle = 0;                                // If next servo is grater than 9, start on 0 again. OutPortTable = &PORTC;    // In 18 channel mode set channel 18 and 19 to a dummy pin that does not exist. DDRC = 63;                      //Set analog pins A0 - A5 as digital output also. PO = Pulse offset in us. -2500 to 2500 in us. Used to trim servo position. I = Invert servo movements. N = Non-invert servo movements. Q = Query movement. Return “.” if no servo moves and “+” if there are any servos moving. QP = Query servo pulse width. Return 20 bytes where each is from 50 to 250 in 10 μs resolution. So you need to multiply byte by 10 to get pulse width in us. First byte is servo 0 and last byte is servo 20. <cr> = Carriage return. ASCII value 13. Used to end command. #0 P1500 T1000<cr> – Move Servo 0 to 1500 μs in 1 second. #0 p24000 T1000<cr> – Move Servo 0 to 1500 μs in 1 second. #0 P1000 #1 P2000 T2000<cr> – Move Servo 0 and servo at the same time from current pos to 1000 μs and 2000 μs in 2 second. #0 P1000 #1 P1200 S500 #2 P1400 T1000<cr> – Move servo 0, 1 and 2 at the same time, but the one that takes longes S500 or T1000 will be used. #define HDServoMode 18 – This will set 18 channels mode so you can use serial in and out. Serial command interpreter is activated. #define HDServoMode 20 – This will set 20 channels mode, and you can not use serial. A demo will run in the loop() routine . Serial command interpreter is not active. 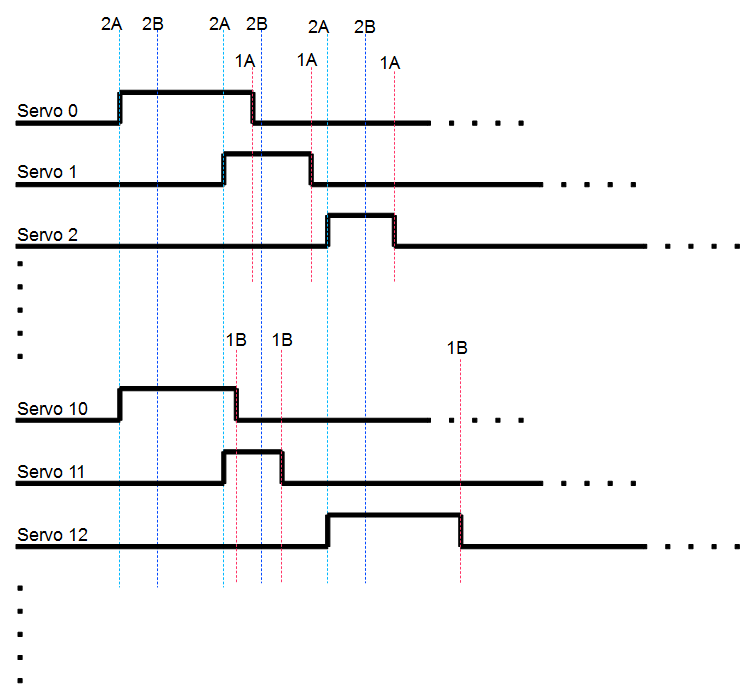 Use ServoMove(int Channel, long PulseHD, long SpeedHD, long Time) to control servos. One of SpeedHD or Time can be set to zero to just use the other one for speed. If both are set, the one that takes the longest time will be used. You can also change the values in the ServoPW array directly, but take care not to go under/over 8320/39680. I hope this will be useful as I can’t see any other doing it the same way on the www. This entry was posted in Software projects. Bookmark the permalink. I saw the code you have made for Arduino uno moving 20 servos. I have a Arduino mega 2560 and I’d like to ask you , how can I use it ? I tried it and servo was sparse in Arduino’s Pin and no in row. Can you help me? Is there any ability of adding in stadard servo library the query movement of servos? You use it in your code with letter “Q”. Can you help me with tĥat? Then you will need to implement the all “Serial interpreter” Block of the code. I might do that some time, but I don’t have the time right now. You will need to find a free timer to run the 50Hz realtime routine. That should be possible on the Mega. Can you modified to work with 100Hz PWM?, “Period total = 10 * 2000 μs = 20 ms => 50 Hz” maybe if you start every pulse 1000 μs after the previous one. I think I will then end with max 10 servos. I am using arduino uno for generating 50 hz signal on 4 PWM pins. by default it generates 500 Hz signal. after surfing i found that by using set pin frequency library ii can generate 50HZ signal but that library is for 8 bit timers, to get 50Hz on 4 channels i would have to use 16 bit timers too, can anyone have an idea how to do that? i test your example but not working. i test and command Q and no print to Serial monitor . or +. i use arduino nano v3 at328p. mabe this is the problem? And what is the problem With the code? Firstly, your program has immense potential for application. thanks for making it an open source. I am trying to send the angles from another arduino to the servo controlling arduino board but not able to get the correct way to print the data from the master arduino. Hi. I’m not sure if I checked for CR or CR+LF at the end of the line. (Carrige Return / Line Feed) And I’m not sure what /r sends. Might be worth looking into. i was trying to control servos via serial-commands today. via serial-monitor, nothing is happening. Even sending Q isn´t working. I did get the “HDServo 18 Channels started…” message in SM, but hitting send doesn´t seem to make anything happen. Did I miss anything? I did vary the messages attaching at the end or leaving it empty and I also changed the options at the bottom right concerning CR, NL and such. Any help would be appreciated. I later on want to send messages from vvvv, but for now, there seems to be no chance to get this up and running. TIMSK0 = 0; // Disable timer 0. This can reduse jitter some more. But it’s used for delay() funtions. #endif // This will disable delay()! I accidently uncommented the “‘define SerialInterfaceSpeed 115200” in the codes description (Four lines above the referenced code), which seems to have messed up the serial-connection. I wouldn´t have been seeing this, if you didn´t point me into the direction of baud-rate. Thx. This is absolutely nice stuff, btw. ! into something like a “9-pin”-mode? I need the other pins to switch some stuff in sync with the movement. some have a month of studying the theory behind your code!? OutPortTable = &PORTC; // In 18 channel mode set channel 18 and 19 to a dummy pin that does not exist. This is almost at the end of the code, in the setup section. be Pin 9 set to HIGH, right? Or would I be able to treat the “dummy pins” as usual using digitalWrite? You would be able to treat the dummy pins as usual. My program is not using digitalWrite for the servos. It uses OutPortTable and OutBitTable which is pointing to the correct pins. So when setting those dummy pins to PORTC and bit 128, the program will not touch the real pins. It will change PORTC,bit 8, which is a non existing pin. Hi. If you use Bluetooth Controller you will need rx and tx for the module. Then there is 18 servos to be controlled. I use 18 servos and a HC-05 module to control a hexapod, but I-m working on a robot that will use more servod, so I planned using two arduinos to controll them. The Arduino Mega can drive upto 48 servos using the standard Arduino Servo library. So you do not really need Arvid’s code at all. To do that I2C interface would be more appropriate. // TIMSK0 = 0; // Disable timer 0. This can reduse jitter some more. But it’s used for delay() funtions. // #endif // This will disable delay()! At least I think that should be enough. Hey Arvid, the Arduino Mini Pro uses the same Atmega328 chip as the Uno, but it has an extra 2 analog pins (PinA6 and PinA7). So it seems like your code might be adapted to drive 2 extra servos, yes? ie: 20 servos with serial, or 22 servos without. The Mini Pro is also the cheapest Arduino around. So there’s probably a lot of people who are running your code on Mini Pros, who could use those extra 2 servos ;). Hi. I’m also planning using pro mini with 22 IO-pins. But my code can’t be easilly adapted for 22 servos. This is because I have focused on precision and that the timing do not overlap. This makes it fixed to 20 servos. Even in 18 servo mode, the code is running the last two servos as dummys. The good thing about the pro mini is that you can use the two extra pins in 20-servo mode and still have RX and TX free. I´m wondering where you are buying your components from? Do you have any recommendations for an aspiring arduionoer? Takker på forhånd, send gjerne svar på epost. Hi. This sketch won’t work with Due without a lot of modification. And I don’t use the analog write function either. Thanks for your fantastic contribution to Arduino comunity. Is it possible to use the Arduino Pro Mini 3,3V board running at 8MHz instead of 16MHz? Which things should be changed in your code? just Prescaler value or more parameters? Have you the final sketch code for 20 servos plus Tx-RX (with command interpreter) for this board that has more I/O pins? After some reading, it seems that A6 & A7 cannot be used as outputs, those 2 pins are unique in that they can only be used as analog-in and nothing else. This is likely the reason why a lot of Arduino Pro Mini boards put pins A6 and A7 in strange board locations: those pins have little use. I suppose it might be possible to use one of them as a serial-in RX pin*, but they can’t be a TX pin, nor as a PWM pin to output to a servo. So the theoretical upper capabilities of an Arduino running an ATmega328 would be 20x servos plus an RX pin, no TX at all, and you’ll also have a spare unused analog-in pin (maybe you could wire this to the battery to constantly measure the load). *If what i’ve read is true and those 2 pins can’t even be digital inputs (can only be analog inputs), then i wonder if that means you’d have to do your own ADC in software if you’re to use them as serial RX. Thanks both for the answer. And what about the 8MHz version instead 16MHz one ? Which things I need to modify in sketch code ? I’m not sure if it will work correctly. if(ServoInvert[Timer2Toggle]) OCR1A = 48000 – ServoPW[Timer2Toggle] – 7985; // Set timer1 count for pulse width. if(ServoInvert[Timer2Toggle+10]) OCR1B = 48000 – ServoPW[Timer2Toggle+10]-7970; // Set timer1 count for pulse width. if(ServoInvert[Timer2Toggle]) OCR1A = (48000 – ServoPW[Timer2Toggle] – 7985)/2; // Set timer1 count for pulse width. if(ServoInvert[Timer2Toggle+10]) OCR1B = (48000 – ServoPW[Timer2Toggle+10]-7970)/2; // Set timer1 count for pulse width. But again, I’m not sure it will work. And it might introduce some jitter. Thanks Arvid for your coments. I printed a SG92-Servo-Robot from here: http://www.thingiverse.com/thing:797211. I would like to control it via an arduino nano. Therefore i found you genious code wich can control 18 servos synchroiously! I saw that you used your lib to control a hexapod. I would like to use the same configuration. Would you mind providing me the code for that? thanks for your comment. I would like to do a similar thing you have done. I use the nano mainly for controlling the servo. then a second one which is on a remote control unit. This one should produce commands regarding on the control buttons on this unit. I think it would not need realtime kinematics in my case. I will try to store the moving patterns in some tables on the nano of the hexapod. Looking forward to your code. very nice work your sketch. But i wrote a sketch for Arduino Nano to send serial commands through serial wireless module but the results are eratics…. I think it mlght be a problem of timing between serial input and servo setting???? Hi. I have not used the code for biped-robot. This is only generic servo controlling code. Then you’ll have to code the movements yourself. Is there a way to turn off the servo after some period of time? Like power off? Or just not moving? You’ll have to control the movement with your own additional program. If you want to turn off the power to the servo, You’ll have to connect it to a MOSFET and then control the MOSFET on or off. Like I did in the useless box-project. how about adding a serial command to stop/start a pin to generate the pwm signal? A servo needs a PWM at all time it has power. If not, the servo will do some unpredictable things. But I want to try. Except the function taking the serial commands, which part of your code should I look at for this experiment? Hi. You’ll have to set ouporttable and outportbit to some dummy values for those pins, as mentioned in some other comment. Then you’ll have to change the init for digital and analog pins. DDRC = 63; //Set analog pins A0 - A5 as digital output also. Your code has been of great importance for my biped. I would like to know whether we can modify the code to do perform an action like attach or detach servo(arduino)so as to decouple the servo pins on demand. Hi. I think that would be dufficult. you may be better off using the standard servo library in Arduino instead. Hi. These servos are not that good for robots, but I’ve used some MG996R from ebay. Some of them ar ok, and some are not that great. Some have a big dead-band, so they are not that precise. But they are cheap, about 5$ each. All servos are connected to + and – 6V, and the signal-pin for the servos (PWM) are each connected to a output on the Arduino. Arduino UNO need 5V, not 6V… Both ground for 5V and 6V are connected together. UNO can handle 20 servos fine, but you don’t have any extra output or input left on the Arduino then to controll other stuff. If you use the MEGA, you’ll need to use the Arduino standard mega servo library. Then you’ll should be able to controll 48 servos on the one MEGA. The standard servo librarey only supports 12 servos for the UNO though. thanks for your response but I checked my nano V3.0 and it use 16 Mhz clock. The ISR is called every 20 ms and I have included at the end of the void loop of my sketch, a flag “Serial.print(“OK”); so I can check with the serial monitor that all datas are correctly sent and that the void loop is completly proceeded . “OK” appears 3 times between the stream of datas. all is OK. I have also a question: what is the lower and higher limit of “T” and “S” parameter? What happens if I resend datas for the same output when the previous is not finished? Yhanks very much for your help… and sorry for my poor english…. T : Limits shoud be 0 to 20000, or there about. The actual limit uppwards is 2 billion milliseconds, but that would not work well. It depends on how long the move is. The longer the move, the longer time limit. If the move is 2000 us difference, the limit should be 2000*16ms=32000ms. It subtract 1/16 of a ms at minimum, for each 20ms cycle. S : Limits should be 1 – 200000 or there about. 0 is fast as possible. 200000 will be 4000us swing in 20ms. If you send new data for the same servo before it is finished. It will calculate the movement from the current position that the servos are at the moment. Or more correct, the position the servo should be at the moment. It does not take into account that servos have a max speed for movements. Your code is excellent – much more robust and stable than most of the other examples around. I would like to be able to use this alongside some other libraries that require me to use PIN 2 – ideally I would like to be able to run a version of your code reduced for 8 servos with this other library. Is it a simple operation to ‘trim’ down to 8 servos? Yes, sort of. The code will prosess all channels but you get the pin free if you set channels to dummy pins. Like channel 18 and 19 in 18 channel mode. Just fill in the channels you’ll not need. I’m wanting to use your code alongside the ‘Wire’ library. Everything compiles and loads fine, however, i’m finding that I am getting some jitter on the servos (only running 8 as per previous post). It looks like it may be the Wire library causing the issues. I was wondering if you have your code implemented with Wire anywhere? Would you know to tell me if possible stop a servo during 10 minutes, and after making it run again?. How must I program motors to stop 10 minutes and run ten minutes in a predefinied way? I think is impossible with delay(), millis() or micros(), but I don’t find how stop it so long. Thanks again for your quick response Arvid. I had read that delay() blocks processor, and prevents to do anything else. I try to do an installation with 20 servos. They must rotate 180º and expect a different time each one before turning to rotate 180º again. Servos do the same 8 hours a day for 3.5 months. Really, I can use delay then? delay(900.000); // …servo1 DELAY 15 min. delay(600.000); // ..servo2 DELAY 10 min. delay(480.000); // …servo3 DELAY 8 min. delay(420.000); // …servo4 DELAY 7 min. delay(360.000); // …servo5 DELAY 6 min. delay(300.000); // ..servo6 DELAY 5 min. delay(240.000); // …servo7 DELAY 4 min. delay(180.000); // …servo8 DELAY 3 min. delay(60.000); // …servo9 DELAY 1 min. delay(30.000); // …servo10 DELAY 30 SECONDS. delay(900.000); // …servo11 DELAY 15 min. delay(600.000); // ..servo12 DELAY 10 min. delay(480.000); // …servo13 DELAY 8 min. delay(420.000); // …servo14 DELAY 7 min. delay(360.000); // …servo15 DELAY 6 min. delay(300.000); // ..servo16 DELAY 5 min. delay(240.000); // …servo17 DELAY 4 min. delay(180.000); // …servo18 DELAY 3 min. delay(60.000); // …servo19 DELAY 1 min. delay(30.000); // …servo20 DELAY 30 SECONDS. Hi. I thought this was interresting and made a new version that can animate all servos in sequenses using 4 arrays. How to use is described in the code. I dont know if I explained it well, but feel free to ask if you wonder about something. The new version should also be more jitter-free. I’ll try understand it. Althought it looks too much for a beginner like me. I had tried much but failed to convert this code for arduino mega 2560. I am beginner so, please help me. thanks in advance. thanks for your time and passion to answer to our comments. I’m working on a project with 28 mircoservos and an Arduino Mega, the total current will be nearly 30A. How can I provide such power supply to my servos? Wish you a great day.